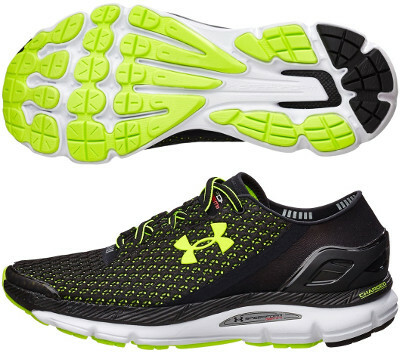 Under Armour SpeedForm Gemini are neutral cushioned running shoes. The Under Armour SpeedForm Gemini is not here to replace the disruptive SpeedForm Apollo but to complement it based on the great platform created a year ago. The outstanding SpeedForm Gemini provides great cushioning and improved sock-fit upper making it able to complete long runs with superlative comfort. It will not disappoint Under Armour's fans. Midsole is the best new feature in SpeedForm Gemini plenty of adaptable cushioning. Although outcome is simple with one layer on top of the other, the secret relies in the new CHARGED® foam between molded 6 mm 4D-Foam® footbed (not removable insole) and well known Micro G® to provide a responsive ride. Outsole has been reengineered as well moving to a more traditional design seeking for more flexibility and improved durability. Last but not least, upper follows one-piece construction with front part made from 2 layer breathable mesh and synthetic rear one. It fits really like a sock, so be aware in order to increase half size when ordering yours. Heel counter not only provides better stability but also has a reflective strip to increase visibility under poor light conditions.